Ionia County in Michigan was looking to build a better bridge, with a simplified approach, at a lower cost and in less time than its recent bridge work, which tended to be complicated, expensive and lengthy construction projects. 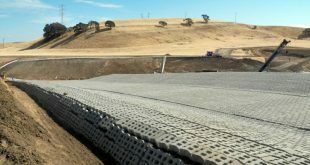 Turning to the State of Michigan’s Department of Transportation and the Federal Highway Administration (FHWA) for design and engineering help, they specified a Geosynthetic Reinforced Bridge Integrated Bridge System (GRS-IBS). Keefer Road Bridge was too deteriorated for repairs, and needed replacing. The engineering team led by Williams & Works, Grand Rapids, MI, wanted to move beyond using standard CMU for the abutment structures and instead use segmental retaining wall (SRW) as the facing material. It could be dry-stacked and met the freeze-thaw requirement of the project’s cold climate. The ability to save time building this bridge with GRS was an important factor in the County’s decision to use it. Compared to bridge construction of the past, with GRS-IBS, no piles are required for the abutment foundations. Neither were concrete footings required. As a result, there were no forms to set, no rebar to place, no concrete to pour and no cure time required. Rather, the Keefer Road Bridge structure is built right on top of a geosynthetic reinforced subsoil structure. Abutments were constructed above the subsoil mass with alternating layers of geosynthetic reinforcement placed at 8-inch increments, and layers of compacted granular backfill. With the alternating layers proving structural stability, there was no need for the facing blocks to hold back a large mass of soil. Scour protection required below the bridge was provided by riprap and also a series of articulating concrete block (ACB) mats. Learn more about GRS-IBS technology.